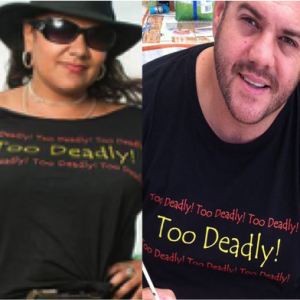 We all want to be “To Deadly” so why not wear a deadly, cool t-shirt or hat. Too Deadly clothing has some great hats to fit all sizes and mens and womens t-shirts for anyone and everyone. Be proud, be deadly with your new hat or t-shirt. We are an Adelaide based Indigenous business. Greg the owner is a Wiringu Aboriginal man born and bread in Kaurna Aboriginal land in Adelaide. He wants to be “Too Deadly” and knows so does everyone else. So through his Too Deadly hats and t-shirts he hopes you will share with him and tell everyone just how deadly you are as you proudly wear your clothing.